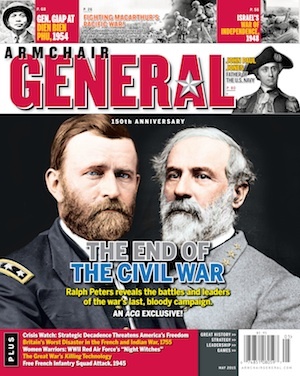 Front Page Features | Armchair General Magazine - We Put YOU in Command! RETRO REVIEW # 1 – Running Wild for 6 Months: A look back at GDW’s ‘1942’. Boardgame Review. Westbound and Down: The Warsaw Pact drives into Southern Germany. High Flying Dice Games’ Land of Confusion 3: The Battle of Hof Gap. Board Game Review. Fighting the Decisive Battle of Yesterday’s Future War. Gale Force Nine’s ‘Tanks: The Modern Age’, Tabletop Miniatures Game Review. “Extradition doesn’t mean anything unless you can catch him.” Fighting A Very Personal War on Drugs. CMON Games ‘Narcos’ Board Game Review. “Torpedoes Los!”. Compass Games’ ‘Raiders of the Deep: U-boats of the Great War 1914-18’ Board Game Review. This Summer, Fishing Season Will Open…on YOU. Upper Deck Games ‘Shark Island’ Board Game Review. Andrea Casarrubea’s new monograph an essential book for historians Great War aerial combat. Book Review. A ‘Flickering, Forlorn Hope’ of victory in War Drum Games ‘Race for Manila’. Board Game Review. Over the Top and Into the Fire. GMT Games ‘Gallipoli 1915: Churchill’s Greatest Gamble Board Game Review.